Christine Choi passes time considering implicit narratives, copywriting for experience design teams, and dreaming of mountains. She holds an MFA from the California College of the Arts, and her writing has appeared in PacificREVIEW, Synecdoche, Paul Revere’s Horse, In Posse Review, Monday Night, and at the Viaduct Gallery, NOMA Gallery, Soundwave Festival, POW! Action Art Festival, Bay Area Poetry Marathon, Small Press Traffic’s Poet’s Theater Extravaganza, and Boog City Poets Theater in NYC. New work will be included in Encyclopedia Volume 3. While East Coast bred, she lives in San Francisco. You can play around with her simple text-vanishing tool, a collaboration with developer Josh Aaseby, at www.boaipsum.com. 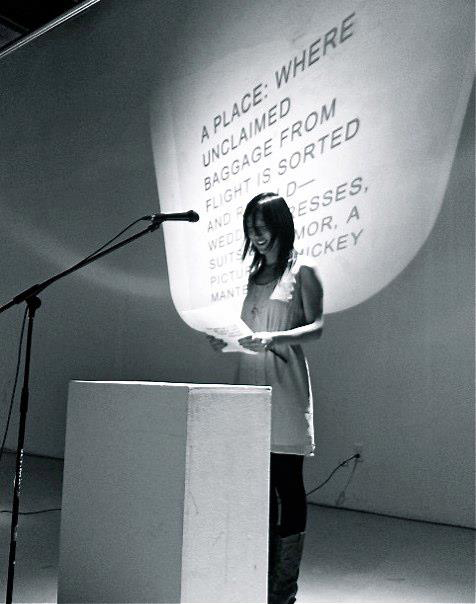 Christine Choi is a contributor to Nerve Lantern issue 9 and suppl. issue 1.